Unkl Presents: Squidward | 'TAIN'T THE MEAT… IT'S THE HUMANITY! 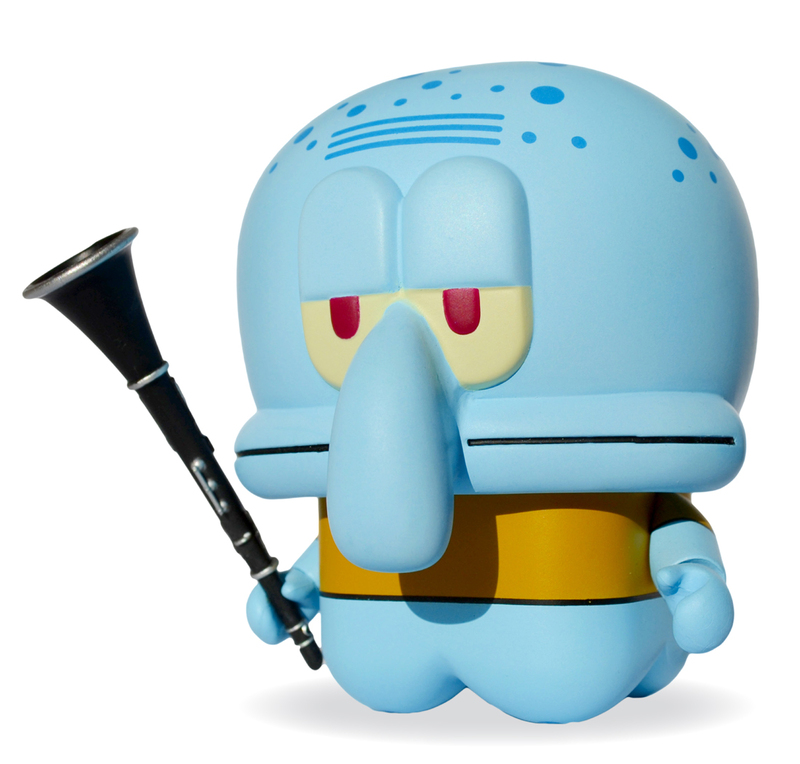 Based on Nickelodeon’s hugely popular SpongeBob SquarePants cartoon, this four inch tall vinyl Squidward was designed by UNKL and released by Toynami in 2012. Based in Portland, Oregon, UNKL have been producing original vinyl toys for over a decade and they bring their unique interpretation to these established characters, all of which are modelled in their chunky UniPo design. The other four characters released in SpongeBob SquarePants Series 1 are SpongeBob himself, his best friend Patrick, his boss Mr Crabbs and The Flying Dutchman. Although I’d heard of the UNKL range this is the first of their toys that I’d actually bought, and I confess I did so because I was attracted to the box, which features a pleasing 1950’s mondo design. Thankfully, once opened I found the toy itself to be well made and the design of the character very pleasing; the toy also comes with one accessory, his clarinet. 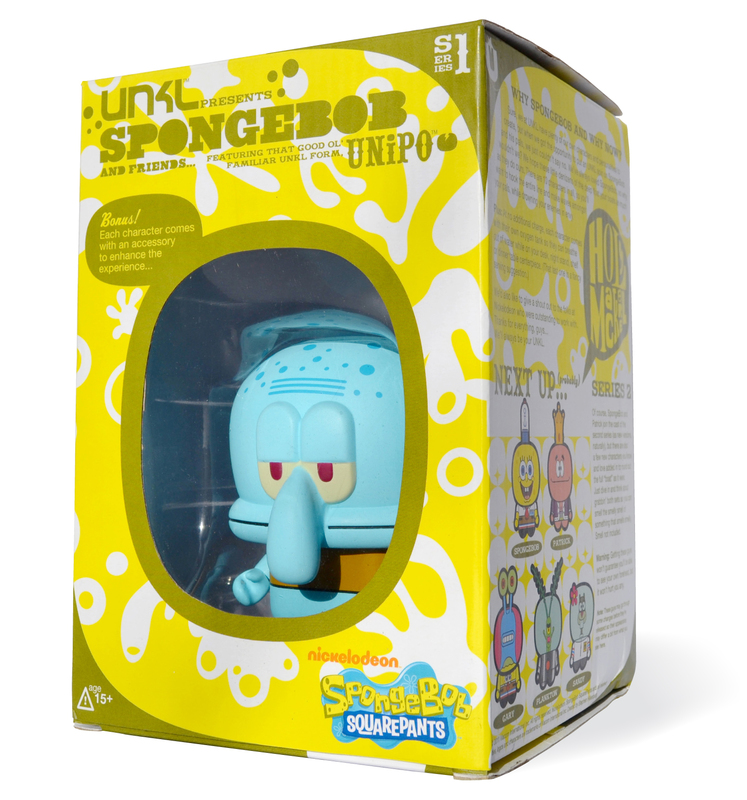 UNKL has done a great job capturing Squidward‘s trademark sardonic expression and I like how they have rounded off his four tentacle legs into curved stumps. But my favourite feature is the Oxygen tank on his back, a great touch that is shared by the other toys in this collection. Series 2 is apparently in the works but the original five can still be readily found in the £/$20 range – not that expensive in relation to other designer vinyl toys but pricey enough to give the penny-pinching Mr Crabbs conniptions. If you’re a fan of Nickelodeon’s off-the-wall cartoon then you’ll no-doubt enjoy the toys in this series, but even if you’re not these four inch toys still have a great deal of appeal and are well worth tracking down.